The lack of rain means pollen counts continue to rise. This time of year its the weed and ragweed pollen that we need to worry about here in the Hudson Valley. 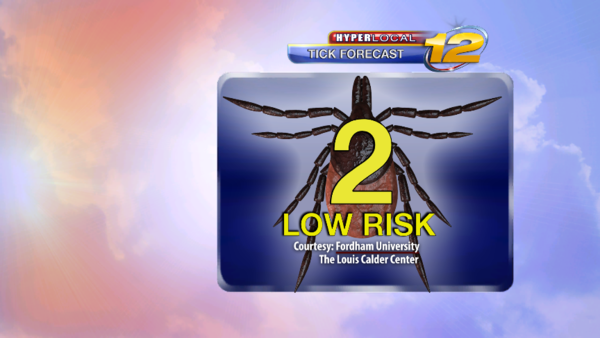 The Fordham University Tick Index for the upcoming weekend here in the HV is a 2 out of 10, which is LOW. Ticks do not like dry weather. HV WEEKEND WEATHER UPDATE: First for Friday. We have a lot of 911 remembrance cememonies going on around the Hudson Valley on Friday. Rain from Thursday and Thursday night should exit the Hudson Valley by daybreak Friday. So Friday is looking dry, with the sun returning for the afternoon. Saturday will feature increasing clouds. Right now, while there could be a few drops around later in the afternoon, I believe most spots will stay dry through Saturday evening. So don't change or cancel outdoor plans for Saturday. Rain showers will work into the Hudson Valley Saturday night and last into Sunday. I don't think Sunday will be total washout, but right now, it looks as if we will be dodging at least a few drops on Sunday. Temps this weekend will be closer to normal; 70's to right around 80. HV WEEKEND WEATHER UPDATE: We are now going to be dodging drops both weekend days here in the Hudson Valley. However, neither day will be a total washout. Saturday will start off with some sunshine, but clouds will be on the increase as we head into the afternoon. Rain showers will arrive after 4pm or 5pm Saturday afternoon, with rain showers likely for Saturday night. However, Sunday will now only feature some widely scattered showers here in the Hudson Valley. Otherwise, it will be partly sunny on Sunday. Highs both weekend days will be in the 70s. One day without rain here in the HV and ragweed already back to moderate severity! Tropical Storm Jaoquin has formed in the Atlantic. As you can see by the forecast track, Jaoquin may work its way up the East Coast this week, and may be close to the Hudson Valley this weekend. Obviously, a lot needs to be worked out between now and then, so please stay close to News12 and News12.com for the very latest. Today will feature only some spotty light rain or drizzle here in the Hudson Valley. It will be breezy and cool, so grab that jacket! Only spotty light and drizzle is possible through Friday morning here in the Hudson Valley. It will stay breezy and cool. But honestly, no real worries in the weather department into Friday. A steadier rain will arrive for Friday afternoon and Friday night. However, under 1” of rain is expected, so again, I see no real worries here in the Hudson Valley. It will stay breezy and cool. Saturday will only feature some spotty rain or drizzle. Saturday is NOT looking like a washout here in the Hudson Valley, but it will remain breezy and cool. IF we have to deal with affects from Hurricane Joaquin, the earliest would be Sunday; AND, Joaquin could still pass out to sea. If that happens, Sunday will end up being dry! I will continue to keep everyone posted. Today and tonight will feature occasional rain here in the Hudson Valley. But under 1" of rain is expected, and as a result, flooding is not anticipated here in the Hudson Valley. It will be breezy and cool, with highs today only in the 50’s, with lows tonight in the 40s. Saturday will feature a leftover showers in the morning. But we should dry out Saturday afternoon. It will remain breezy and cool Saturday, with highs again only in the 50s. With Hurricane Joaquin now staying out to sea, Sunday looks dry here in the Hudson Valley! It will be partly sunny Sunday, with highs up near 60 degrees. Here is your Thursday morning allergy report for the Hudson Valley. Here is your updated Fall Foliage Report for around New York State. The hard freeze from earlier this week here in the Hudson Valley seems to have killed a lot of those pollen bearing plants! Here is your Monday morning UPDATED allergy report for the Hudson Valley. Here is your Halloween Forecast for the Hudson Valley. 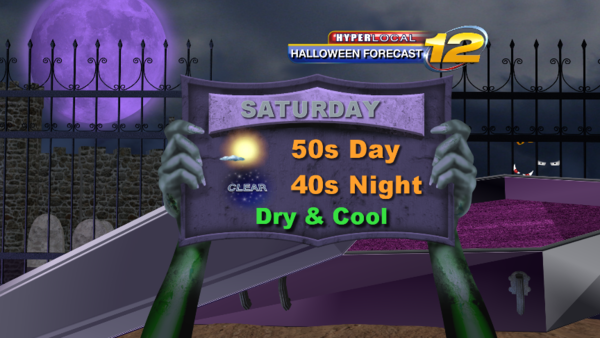 Stay close to News12.com for your updated Halloween Forecast as we head through the week. Here is your Wednesday morning allergy report for the HV. 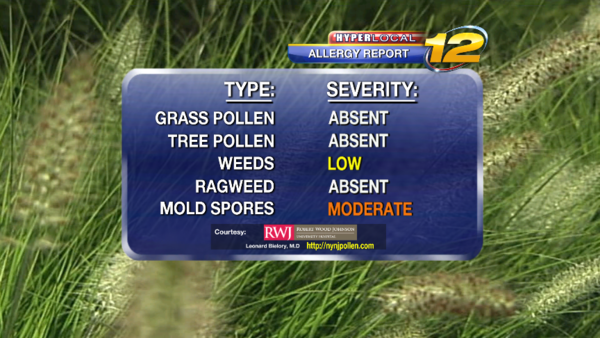 Mold spores are down from earlier in the week. 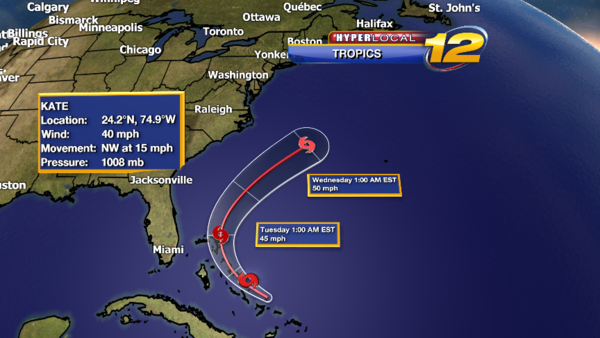 Tropical Storm Kate as formed near the Bahamas this morning. 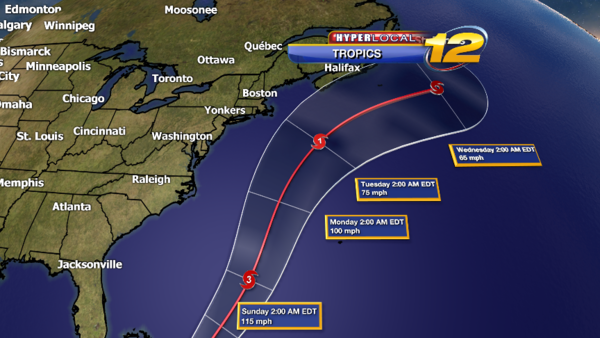 The track of Kate will take it far away from the US East Coast over the next fews days. As a result, it does not look as if Kate will affect our weather here in the Hudson Valley. Of course, if things change, I will let everyone know. VETERANS DAY FORECAST FOR THE HV: A few leftover showers are possible very early in the morning on Wednesday here in the Hudson Valley. However, after 9am conditions look mainly dry, with some partly sunny sky expected by Wednesday afternoon. Highs will be seasonably cool in the 50s. Tune to News12 or www.news12.com for LIVE weather updates concerning the Veterans Day Forecast here in the Hudson Valley. Here is your Monday morning allergy report for the HV. Looks as if the allergy season has come to an end here in the Hudson Valley. 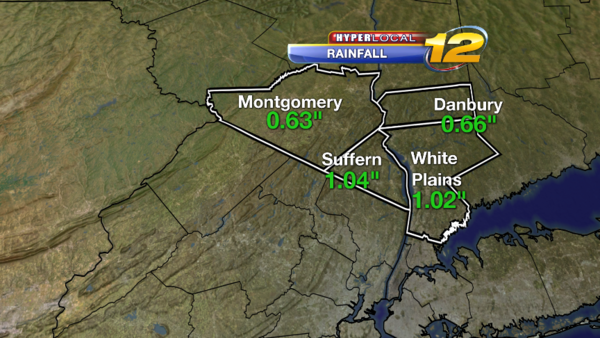 Here are some rainfall totals from the mini storm that affected us on Thursday. While today is the 1st day of winter here in the Hudson Valley, winter doesn't officially arrive until 11:48pm. This is when the sun's rays intercept the Tropic of Capricorn (23.5deg South Latititude) at a 90 degree angle, which signifies the beginning of winter. So most of today will be the final hours of fall. For more information on the 1st Day of Winter, click here. Thursday will feature mostly cloudy sky here in the Hudson Valley, with only a few widely scattered showers possible. However, most of Thursday will be dry. Temperatures will reach record breaking levels here in the Hudson Valley on Thursday. High temperatures will soar into the lower 70s, well above the previous record high of 57F set just last year in 2014. Christmas Eve itself will be dry and mild with temperatures around 50F overnight here in the Hudson Valley. Christmas Day will feature a lot extra clouds here in the Hudson Valley. Conditions look dry at least into Christmas evening, with the chance for rain showers increasing Christmas Night. It will be another mild day, with highs on Christmas in the lower to middle 60s. 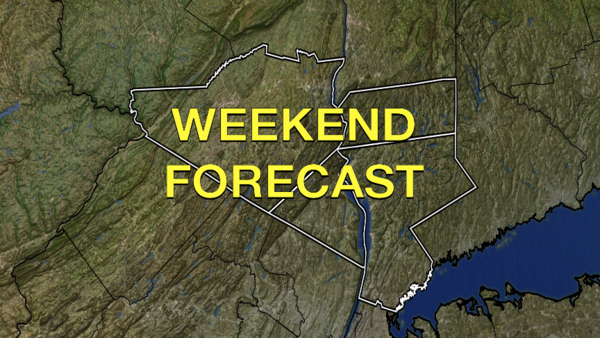 Saturday and Sunday will be unsettled here in the Hudson Valley. Neither day is looking like a total washout, but the threat for scattered showers will be with us each day this weekend. Temperatures will continue to run mild for late December with highs around 50F Saturday, and around 60F on Sunday. 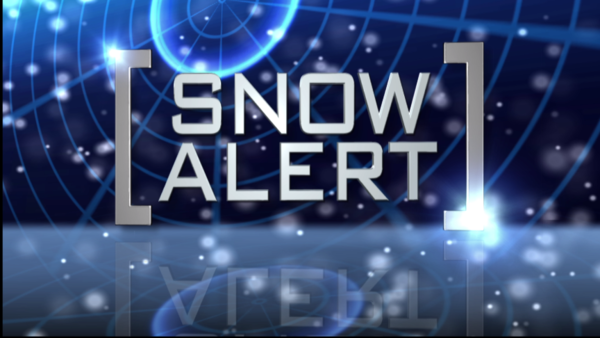 HV SNOW ALERT: How quickly things can change! We have the chance for some wintry weather here in the HV starting Monday night and lasting into Tuesday morning. As of Saturday afternoon, it looks like snow or a snow/sleet mixture will develop after 10pm Monday night. Snow/sleet will quickly transition to plain rain by 7am Tuesday. Accumulations of snow/sleet will be a coating to 2”. Snow/sleet will slowly transition to plain rain by 10am Tuesday. Since the changeover will take longer, 1-4” of snow/sleet accumulations are possible. All of us here in the Hudson Valley will experience plain rain Tuesday afternoon, as temperatures climb above 32F. We still have a few days to watch this, so the forecast could/will change. I just wanted to give everyone an early heads-up. I will update this forecast sometime on Sunday. HV SNOW/SLEET UPDATE: The 1st wintry weather of the season will affect the Hudson Valley late Monday night into Tuesday morning. This will not be a major storm, and we will see more sleet than snow in most communities. However, travel will be tricky early Tuesday morning for a few hours. The snow/sleet will develop around midnight Monday night here in the HV. Snow/sleet will quickly change to sleet and then to plain rain by 6am Tuesday morning. Snow and sleet accumulations will be a Coating to 1”. Snow will change to sleet and then gradually to plain rain from 6am to 10am Tuesday morning. Accumulations of snow and sleet will be 1” to 2”, with a slight chance of seeing 3” North of I-84. All of the Hudson Valley will experience plain rain by late Monday morning, as temperatures climb well above 32F. So once again, not a major storm, but travel will be a bit tricky for a few hours early Tuesday morning. I will send another update on Monday. HV WINTER WEATHER UPDATE: A Winter Weather Advisory is in effect for the entire Hudson Valley for later tonight into Tuesday morning. This will not be a big winter storm, but travel will be tricky for a few hours early Tuesday morning. Snow/sleet or just sleet will develop between 9pm and Midnight. The icy mix will change to plain rain by 5am Tuesday morning. 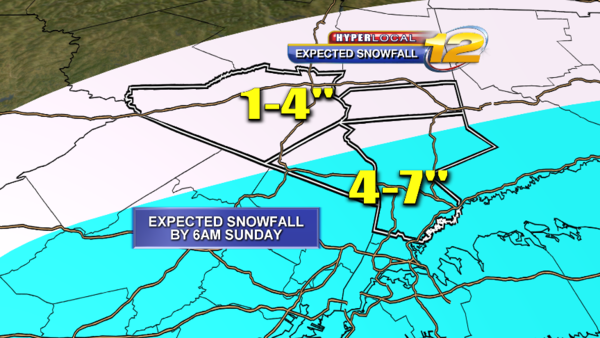 South of I-287: Accumulations of snow/sleet/ice will be a Coating to 1/2”. If you live South of I-287, by 6am road conditions should be improving. Snow or a snow/sleet mix will develop between 9pm and Midnight. The wintry mix will gradually change to plain rain, from south to north, between 5am and 8am Tuesday morning. 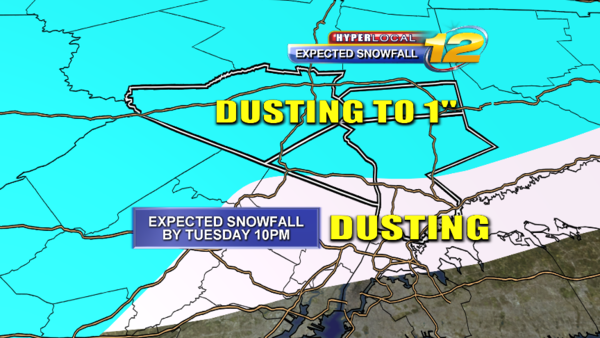 North of I-287: Accumulations of snow/sleet/ice will be a Coating to 1” (slight chance for 2” North and West of I-84). So if you live North of I-287, road conditions should be improving by 8 am Tuesday morning. Stay close to News12 and news12.com for LIVE weather and traffic updates into Tuesday. For those wanting a real good read about El Nino...What is is and what is means...Click here. 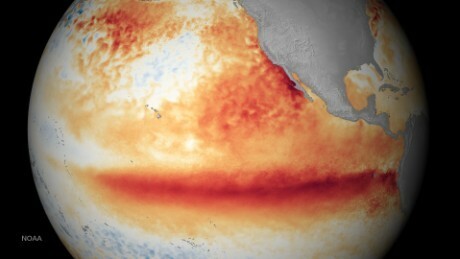 CNNThis year's El Niño is wreaking weather-related havoc across the globe -- and Oxfam says it could leave tens of millions exposed to hunger and disease. There could be some light wintry mix in Orange and Putnam Counties tonight. No worries overnight in your local community. Temperatures will stay above freezing, so just a plain rain shower or some spotty drizzle is possible overnight in Rockland and Westchester Counties. The rain could mix with some sleet/snow, but with temps above 32F, roadways will be perfectly fine for travel all night long. I don't think this is going to be a major issue, so I would not cancel plan tonight at this point. However, there could be a little freezing drizzle or some sleet/snow around overnight. This is especially true for locations along and north of I-84, and in elevations above 800'. The key tonight is that anything that falls from the sky will be light, and so will have minimal impacts. By Saturday morning, all locations will be above 32F, so any rain that falls Saturday will be plain rain Hudson Valley wide. It looks like the Hudson Valley will experience some snow showers starting after 2pm Tuesday afternoon and lasting until 9pm Tuesday night. With that being said, it will not snow the entire time. In fact, "showers" mean on and off. Additionally, I am not expecting much in the way of accumulation on the roads. So I would not change or cancel plans for later Tuesday here in the Hudson Valley. However, a few heavier bursts are possible, which could dump a quick Dusting to 1" of snow in your hometown. The best chance to see up to 1" of snow would be in elevations above 800'. Snow showers will affect the Hudson Valley between 2pm and 10pm. Showers mean "on and off", so it will not snow the entire time. However, some heavier bursts of snow are possible, especially during the evening commute. With that being said, I think roadways will be OK for travel, so I would not change or cancel evening plans. Just know there will be some flakes around. Total accumulations will range from a Dusting South of I-287, to a Dusting to 1" for locations North of I-287. Stay close to News12 and News12.com for LIVE updates right into tonight. So the big question this morning...Will we see a snowstorm later this week? What I can say right now is that this does look like the best chance so far this winter for a big storm here in the HV. Right now, ALL the computer models we use are pointing towards snow. If the storm hits us, right now, the timing looks like Friday night into Saturday. Currently, I am seeing no rain...This will either be snow or a near miss out to sea. We are still on track for a snowstorm this weekend here in the Hudson Valley. I am hesitant to talk about too much detail at this point, since the storm could still take a southerly track, which would give us a glancing blow or a near miss. However, at this point, I would prepare for snow starting at 8pm Friday and lasting until 10pm Saturday. In addition, 6+" of snow is possible here in the Hudson Valley by Saturday night. But again, if the storm takes a more southerly track, we will see less snow. A Nor'easter will affect the Hudson Valley this weekend. Right now, I would prepare for snow starting from 4am Saturday morning and lasting until 4am Sunday morning. This means if you have plans Friday evening you are good-to-go, so don't cancel those plans! Currently, the storm looks to be an all snow event here in the Hudson Valley, with temperatures on Saturday in the upper 20s. More than 6" of snow is a distinct possibility here in the Hudson Valley with ths storm. However, if the storm takes a more southerly route, snowfall totals will be lower, especially up near the I-84 corridor. There could be a sharp cut-off between significant snow and ligther snow amount. 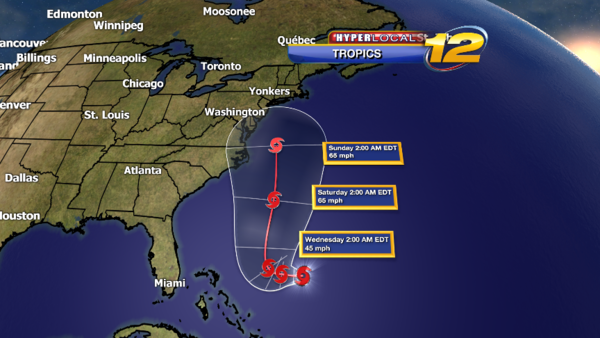 As we get closer to the onset of "the event" on Saturday, this forecast is becoming increasingly tricky. It will be a battle between an intensifying storm along the Eastern Seaboard and a large mass of cold, dry air building across northern and central New England. What makes this a tricky forecast is the placement of a very sharp cut-off line between little or no snow and potentially, lots of snow. Based on the latest run of the European model, the range of potential snow for the Hudson Valley is quite large. Down by the Westchester/Bronx border and along the Sound shore, as much as 10 or 12 inches of snow is a possibility. Meanwhile, as you head north, the forecast amounts rapidly drop off . . . 6 inches for central Westchester . . . around 3 or 4 inches for the Westchester/Putnam border and up in the I-84 corridor of northern Orange and northeast Putnam maybe an inch or two. Parts of Ulster and Dutchess Counties may not see much more than a few flakes! If the dry air becomes more entrenched in our area, the snow threat will be lessened, but for the moment let's play devils advocate. Snow will get started sometime early Saturday . . . probably will peak in intensity during the afternoon and evening, then diminish after midnight and finally end early Sunday. Strong and gusty winds will cause cut and reduced visibility and lower Westchester might experience near-blizzard conditions for a time later Saturday and part of Saturday night. Highs on Saturday will be in the upper 20's. 3 to 6 inches north of I-287 and 6 to 10 inches south of I-287. These numbers will probably be "massaged" a bit between now and Saturday morning based on new computer runs, so stay tuned! By the way . . . the Euro is forecasting 3 to 6 inches for coastal Connecticut, 12+ inches for NYC . . . 10 to 18 inches for Long Island and perhaps upwards to two feet for central and south Jersey! Any good news? Yes . . . the January thaw will set in early next week. Temperatures will rise into the mid and upper 30's on Sunday and Monday and the lower 40's for Monday and Tuesday. To be continued (as life itself) . . . 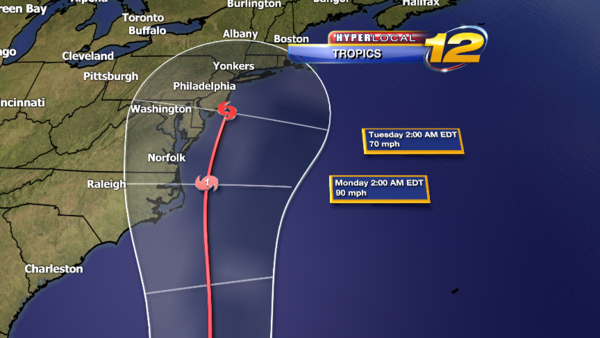 The Nor'easter for this weekend is taking a bit more of a southerly track. This means the Hudson Valley will be on the northern edge of the precipitation shield. As a result, this will NOT be a crippling storm for the Hudson Valley. Snow will develop around 6am Saturday from South to North. Most of Saturday morning will feature light and scattered snow. Most of the accumulations with this storm will occur during Saturday afternoon and Saturday evening. The accumulating snow should be out of here by 6am Sunday morning. As you can tell from the above map, accumulations will range from 1" to 7" here in the Hudson Valley, with the most snow falling the farther south and east you go. A clear, cold, tranquil night on tap for tonight as a dome of high pressure centered over the Great Lakes expands into the Northeast U.S. overnight into Friday. Lows will range through the teens . . . urban and coastal areas will be near 20, while interior valleys will hover close to 10. Friday we'll see high clouds veil the Sun during the afternoon hours, with afternoon highs in the lower to middle 30's. I've been watching the weather on radio and television for a long time . . . 38 years this coming June . . . and Saturday's "event" strikingly reminds me of a famous snowstorm that hit during Presidents' Day weekend of 1979. That storm concentrated much of its fury over the Middle Atlantic region . . . Dover, Delaware saw 25-inches . . . Baltimore/Washington 18 to 20-inches. Farther north however, snow totals were much less: 8 to 12-inches for New York and only about 1 to 6-inches for much of the Lower Hudson Valley. Cold and dry high pressure forced the storm on more of a southerly track relative to our area, hence, less snow. It appears that most of the computer models . . . save for the always schizophrenic NAM (North American Model) are finally all getting on the same page and forecasting a somewhat similar scenario to 1979 for this coming Saturday. Based on the latest run of the European, Canadian and GFS models, the range of potential snow for the Hudson Valley is being lowered just a bit from what Brysen Van Eck was forecasting this morning. Generally a 3 to 6-inch snowfall is now anticipated over southern Rockland and central and southern Westchester, while 1 to 3-inches appears on tap for northern Rockland and Westchester, as well as all of Orange and Putnam. The storm is still more than 36 hours away and it is not out of the question that these numbers might come down even more . . . the trends have been working in that direction. Snow will get started sometime between 5 and 9 a.m. . . likely will peak in intensity during the afternoon and evening, then diminish and finally end sometime between 10 p.m. Saturday and 2 a.m. on Sunday. Strong and gusty NE winds to over 40 m.p.h. will cause cut and reduced visibility, and lower Westchester might experience near-blizzard conditions for a short time later Saturday and part of Saturday evening. Highs on Saturday will be near 30. Coastal flooding along the Sound shore is also a distinct possibility thanks to the strong winds, higher-than-normal tides and a Full Moon. My feelings are that NYC and Long Island will be in line for at least 6-inches to "possibly" 12, but that higher amount will depend on either a more northerly storm track or greater intensification of the storm. 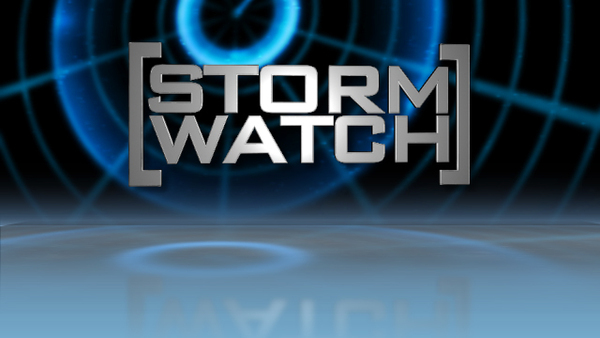 A Blizzard Watch is in effect for these areas. Any good news? Yes . . . the January thaw will set in early next week. Temperatures will rise into the mid 30's on Sunday and the upper 30's and lower 40's for Monday and Tuesday. So just when we thought this storm was going well south and east of the Hudson Valley, our old friend the European model, has now moved the storm a bit farther north. So with that in mind, and considering these models have a tendency to move around a bit, I am pretty much standing pat with my forecast snow totals from yesterday. Snow will gradually overspread the Hudson Valley Saturday between 4am and 7am from south to north. However, it could take until after 7am for the snow to arrive up near I-84. Regardless, the heaviest of the snow and the wind will be with us Saturday afternoon into Saturday evening. The snow will end by dawn on Sunday. This contines to look like an all snow event for us, with temps in the 20's throughout the storm. As you can see from the above graphic, I am bumping up forecast snow totals back to where they were yesterday morning. However, if we see the storm move farther north, those totals could increase just a bit. If the storm moves father south, they will decrease just a bit. In the end, I am still not expecting a crippling storm for the Hudson Valley, as any double-digit snowfall totals should stay to the south of us. As of early Friday afternoon, we have a few changes to the forecast for the Hudson Valley. The biggest change right now relates to the timing of the storm. The storm is moving a bit quicker, so now, you can expect snow to develop between 1am and 4am early tomorrow morning. In addition, a Dusting to up to 2” of snow is now possible by 8am Saturday. Also, the heaviest of the snow will now be with us from late morning on Saturday into Saturday afternoon. But with the storm moving quicker, the snow should be done by midnight Saturday night. As to accumulations, the models are nudging the storm a bit farther north. I still think we will be spared double-digit snowfall totals, but I am upping my southern range from 4-7” to 4-8”. Of course, and I don’t say this lightly, this is a dynamic and evolving situation. The storm is moving more rapidly than had been originally been projected. It's currently along the South Carolina coast and by 7 a.m. Saturday it will be at peak intensity near Norfolk, Virginia. The storm will then lateral its energy to a second storm that will develop a couple of hundred miles away to the northeast . . . that second system will then rocket northeast to a position a couple of hundred miles southeast of Cape Cod by Saturday evening. High pressure will build in late tomorrow night into Sunday, bringing copious sunshine for Sunday and Monday. Because of the fast movement, it appears that snow could begin falling across the southern parts of the Hudson Valley sometime between 10 p.m. and midnight . . . spreading across the rest of the area during the second half of the overnight. The heaviest and steadiest snow will fall from 7 a.m. to 1 p.m., possibly winding on down during the afternoon. The snow should finally quit most everywhere by late Saturday evening, before midnight. The gradient of the expected snowfall will be unusually tight, with only 1 to 2 inches along and north of I-84 . 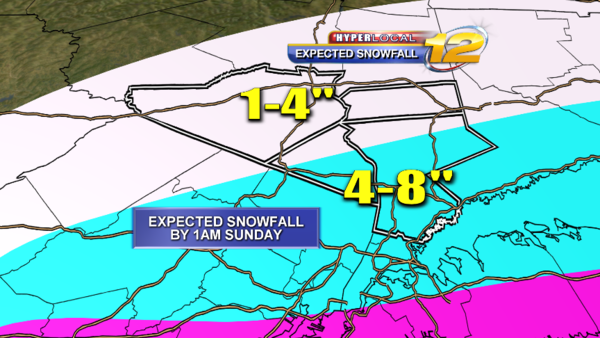 . . between I-84 south to I-287, amounts will increase from 2 to 6 inches . . . and south of I-287, anywhere from 6 to 9 inches is now expected. Another complication will be the northeast winds possibly gusting to 50 m.p.h. or more. That will cause near-blizzard-like conditions at times. In addition, at the late-evening high tide cycle on Saturday along the Sound shore and Hudson River, tides could run as much as 3 to 4 feet above normal, possibly causing minor-to-moderate coastal flooding. Thanks to the rapid movement of the storm(s), skies should rapidly clear after midnight Saturday night, and the strong winds will rapidly diminish as well. Sunday and Monday will see sun-filled skies with highs in the mid-to-upper 30's, perhaps reaching the lower 40's by Tuesday.